If you are looking for some last minute stocking stuffers, consider picking up a few USB flash drives. I rely on USB drives to regularly transfer images, files and folders. Here are some of my favorite ones. 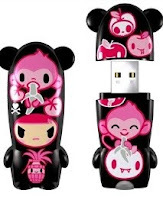 You'll find different designer USB flash drives on mimico.com - Star Wars, Hello Kitty, Domo, toikdoki and more. Pink Meletta by tokidoki, $34.95 and Star Wars C-3PO MIMOBOT®, $39.95. The Verbatim 2GB - Tuff-'n'-Tiny™ USB Drive, $22 is penny-thin, travel-tough and water-impermeable. 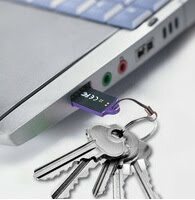 It fits in all standard USB ports, resists dust, water and static discharges and offers password security for Windows users. It comes with a convenient lanyard to attach to your key ring. This HP c335w Flash Drive - 8 GB, $19.99 (on sale at buy.com for $20.37, includes shipping) is super thin and has a crystal accent.